You can easily learn how to make polenta perfectly each and every time with these easy instructions. Not only do we show you how to make a the basic recipe, but we also have two absolutely fabulous variations that will become easy dinner recipe staples in your home from now on. Mix the cornmeal and 3/4 cup water in a 2 quart saucepan. Stir in the boiling water and salt. Cook, stirring constantly, until the mixture thickens and boils. Reduce the heat to low. Cover and simmer for 10 minutes, stirring often, until very thick. Remove from the heat. Stir until smooth. Grease a 1 1/2 quart casserole with shortening or non-stick spray. Prepare the polenta according to the directions above. Spread 1/3 of the cooked polenta in the casserole. Dot with 1 teaspoon of butter. Sprinkle with 1/3 cup grated parmesan cheese. Repeat the layers 2 more times. Sprinkle with 1/3 cup shredded mozzarella cheese. Bake uncovered at 350ºF for 15-20 minutes or until it is hot and bubbling. Spread the polenta in a greased rectangular 13″x9″x2″ baking pan and refrigerate uncovered about 3 hours or until it is firm. Invert the pan to unmold the polenta. Cut into 6 squares or into 1/2″ wide longer slices. Cut the squares into triangles before frying, if desired. Melt 2 tablespoons of butter or oil in a 10 inch skillet over low heat. Cook the slices for 5 minutes on each side or until they are golden brown. You can serve the polenta slices with molasses, jam, maple syrup, sour cream or spaghetti sauce. You can add some parmesan cheese to the recipe while it is cooking for added flavor. For best results, add it near the end of the cooking time. Some people recommend coating the polenta slices with flour, others not. I would try it without the flour. If you really feel that you need it, coat the pieces with flour first. When cooking polenta, it really IS important to stir it constantly. Otherwise you risk it turning lumpy. There’s not much worse than lumpy cornmeal. Instead of frying the polenta pieces, try grilling them. Fabulous with that little bit of char flavor! Just rub a touch of oil on any side of the piece that will come in contact with the grill. Polenta is a nice change from pasta. The first variation is a baked casserole that adds cheese to the cornmeal mixture. Layer a bit of butter and some parmesan cheese, top the casserole with grated mozzarella cheese and bake to ooey gooey perfection. The second variation is fried. Frying cooked polenta is a particularly good way to serve it as a side dish with any meat dish, particularly beef. 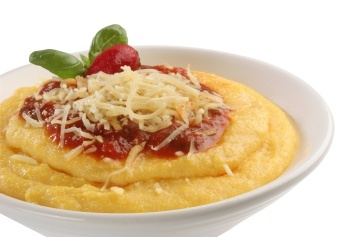 If you watch the cooking shows you have probably seen a lot of variations on polenta. You can see from the serving suggestions listed that you can also eat the fried cornmeal mixture with something sweet like jam or maple syrup. I am not too sure about the jam myself but the syrup would be good. When I grew up, seeing my mother cook cornmeal meant we had a spicier tomato sauce coming. Traditionally (in our family at least) the cornmeal was served topped with a sauce that usually contained spicy Italian sausage. The cornmeal on its own is a bit bland so it takes on other flavors nicely. The spice of the sausage was a perfect pairing. Serve this polenta with our chunky tomato sauce with basil, an authentic Italian pasta sauce. Add hot Italian sausage to make it just like Mom used to make.